The LSIU-01 is an precision isolated constant voltage/current type stimulator combined with an analog isolation amplifier front end. 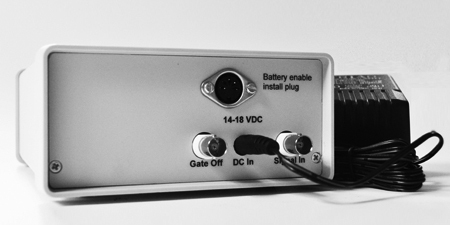 The power to this unit can be supplied by an external power pack or by an internal rechargeable battery.In voltage mode the LSIU-91 serves as an isolated gain X50 amplifier with up to +/- 100 Volt output range. In constant current mode the LSIU-01 accepts an arbitrary analog signal of +/- 2 volts and converts it into a current of +/- 2mA with +/-100 volts of compliance with a bandwidth of 10KHz. 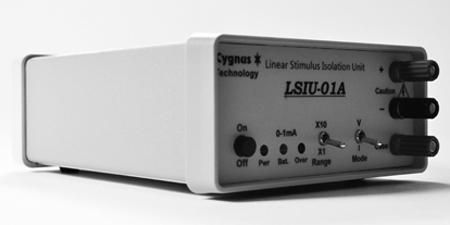 The LSIU-01 utilizes a Cygnus manufactured ultra high isolation DC-to-DC convertor which eliminates the need for expensive battery replacement. This switch enables the output stage power. The internal battery charging circuit is still functional as long as the power pack is plugged in. This switch selects voltage or voltage to current mode. The red LED will light any time the output exceeds 90% of maximum. The RED banana terminal is output positive and the BLACK banana terminal is negative. The GREEN banana terminal is the connected to the case but is otherwise floating. +14 to +18 volts DC power should be connected here. Center pin should be positive. 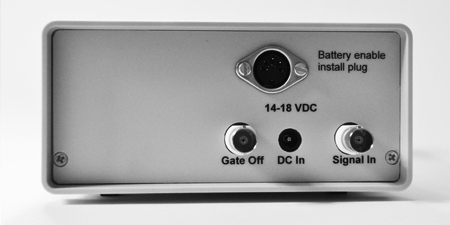 This input accepts between an analog voltage siganl up to +/- 2 vcolts. 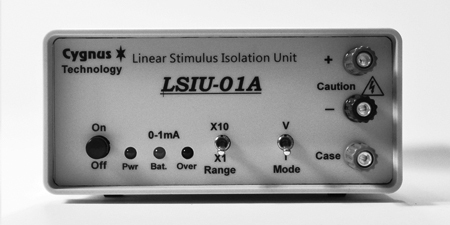 The LSIU-01 is very simple to use. Plug the power pack of the LSIU-01 into an AC outlet. Apply a voltage signal to the rear BNC. Turn on the LSIU-01 power switch. Select Voltage or Current mode and the LSIU-01 will either isolate and amplify the input signal or convert the input waveform to a curent signal. CAUTION!!!! The voltage between the red and black banana terminal can exceed 100v. Take care when monitoring the outputs with other instruments. Without a resistor load (example 10k ohm) between red and black terminal, damage to other equipment may occur.